Math students at the University of Rochester prefer to think of March 14 as 3.14. The number is an approximation of the mathematical constant pi, which is the ratio of the circumference of a circle to its diameter. In many past years, March 14 has been the occasion for a host of activities celebrating Pi Day on Rochester’s River Campus. 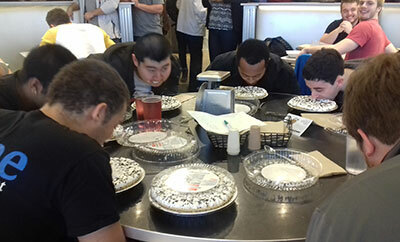 Because the day falls over spring break this year, festivities—including a popular pie-eating contest—will span “Pi Week” from March 19-23. Members of S.U.M.S will be selling t-shirts and pi pins. Get together with your math-oriented peers for Board Game Night. Participants will be able to play board games, eat pizza, and be part of a Rubik’s Cube Competition. Whether you want to truly celebrate pi or you just want to have some pie, join the Pi(e) Eating Contest where you will eat as much from a single pie as possible in the time limit. If you are one of the fastest, you will receive a prize. Speak informally with alumni, faculty, and student organizations about career options in STEM (Science, Technology, Engineering & Mathematics) fields. This event is limited to first-years and sophomores and is geared toward women and under-represented minorities. Space is limited; registration is required here. Join SWAP (the Society of Women in Astronomy and Physics) for an interactive luncheon and workshop on Communication and Negotiation Skills for Women in Science. 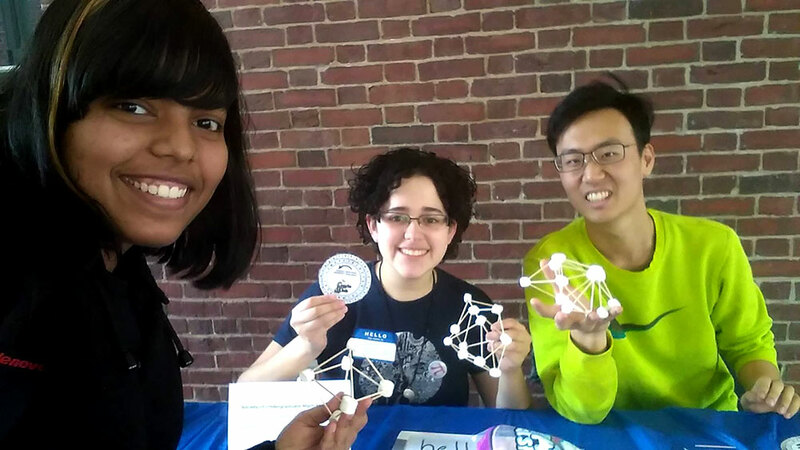 The community of math students at the University of Rochester has been solidly growing: since 2015, the percentage of undergraduates in the College who are majoring in math has been on a steady rise. The University’s registrar reports that in 2017, nearly 10 percent of the total number of Arts, Sciences & Engineering graduates completed a math major, the highest percentage ever at the University, and one of the highest of any institution in the country. In 2015, the most recent year for which national data is available, the National Center for Education Statistics estimated that math majors earned only 1.2 percent of the total number of bachelor’s degrees conferred by postsecondary institutions. Although it is not a perfect comparison—compared to other institutions, for example, Rochester boasts an unusually high number of students who graduate with more than one major—the figure puts the University of Rochester well ahead of the curve. According to our Institutional Research Office, only the Massachusetts Institute of Technology, the University of Chicago, and the California Institute of Technology graduated higher percentages of math majors compared to total graduates. 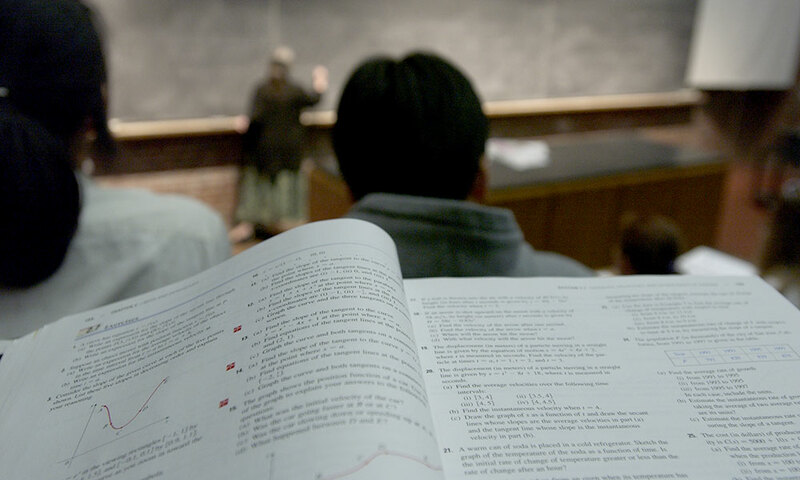 Tom Tucker, professor and chair of the Department of Mathematics, attributes the popularity of math among Rochester undergraduates to several factors, starting with his and his colleagues’ general philosophy of math education. Some institutions start from the assumption that many students will not be capable of successfully completing a math major. They offer “weed-out” classes, aiming to separate the wheat from the chaff, and consequently fulfill their own expectation that few will prosper in math. Tucker starts from the opposite assumption. He points to a 2012 forum on STEM higher education in which several experts charged that weed-out classes were “killing STEM achievement.” Guided by the conviction that many students can succeed in the course of study, he’s adamant the department assist all motivated students in reaching their full mathematical potential. “If students can’t do the work, then they can’t do the work; but we’re not here to try to weed anybody out,” Tucker says. The department currently offers a regular track and an honors track designed for those students who want to pursue graduate studies in math. Classes such as Graph Theory and Operations Research now have more of a data science focus, and Tom Tucker says the department offers more applied and practical mathematics courses than it once did. A popular course in cryptography, for example, touches upon digital signatures, secure computing, and digital voting. Department faculty say these classes prepare students to enter a competitive career market in which quantitative skills—precisely the abilities honed in math courses—are vital to landing a job. In fact, their arguments are similar to those that faculty in the humanities make about the value of qualitative, critical reasoning skills honed in their courses. In the long run, it’s as much about the habits of mind that the discipline fosters, as about the specific content of any mix of courses. Twenty years ago, two members of the math department faculty—Arnold Pizer and Michael Gage—developed a revolutionary new tool called WebWork that allows students to get timely feedback on homework. The program is used widely in the department and is particularly useful in courses with large enrollments. “WebWork is an integral part of our calculus sequence,” says Tom Tucker. The online program scores assignments immediately, freeing faculty members from stacks of paperwork. Faculty are instead able to focus on being more accessible to students, holding more office hours and assisting students in areas where they may struggle—or be available to discuss issues, theories, and concepts of interest. The Student Undergraduate Math Society, or S.U.M.S., isn’t just a magnet for students like Sofia Carrillo ’19, the president of the club and a self-described “math geek.” It also helps make a much larger group of math students feel like they’re part of a math community at Rochester. In addition to the Pi Day celebration each March, S.U.M.S. holds game nights, sponsors speakers in a variety of math-related disciplines, provides tutors to local K-12 schools, and holds information sessions about careers, graduate school, fellowships, and research. “When we do outreach, it’s fun watching kids get excited about hands-on math demos,” says Mark Auden ’19 (KEY), last year’s president of S.U.M.S. For his Kauffman Entrepreneurial Year (KEY) Program capstone project, Auden is developing an interactive, online math reference tool for students and professionals, which addresses some of the math shortcomings in online encyclopedias. Highlighting the breadth of math in the world around us is evident in the department’s current class offerings and upcoming initiatives. As for the future of the department, Tom Tucker hopes to incorporate new technologies and software in the classroom and integrate more programming projects to help students stay competitive in the job market. But, he also lauds the fact that math harks back to days of the simple tools of pencil and paper.